Why don’t Gen Y women buy from you? Gen Y women reached the age of a quarter-century. They are ambitious, and eager to have a real impact. They are also extremely active online users and socially engaged. They put education on the first place on their priority list. They don’t like to be disrupted, but prefer interactive campaigns. Women account for 65% of global consumer purchases. Moreover, 1 in 3 of these consumer women is aged 18-34. Harris Interactive estimates that Gen Y spent more than $120 billion in 2007. While Gen Y women tend to be skeptical of marketing messages, they respond to brands and messages they perceive as “authentic”. Knowing that Gen Y women represent a big segment of your target market, you should conceive special marketing campaigns to attract them. But before you start working on the next marketing campaign for Gen Y women, you should know a few essential data on what they enjoy, why they enjoy it and where you can reach them with your marketing message. I am a Gen Y woman and I could tell you plenty of things about what I enjoy and what marketing channels I use most but that won’t help you. That’s why I chose to help you with a study by Radar Research, which conducted a survey on 1,018 women aged 18–49, from a demographically representative sample. I will present below three main facts about Gen Y women, revealed by the Radar Research study. Let’s take for example the fact that Gen Y women appreciate reviews from their peers before making a purchase (bloggers, online friends or even anonymous reviewers), unlike the previous Gen X women generation, which are more likely to make a purchase according to an expert opinion. So forget about paying a famous figure in your industry and just start collaborating with visible bloggers. Also, don’t forget to post some of your customer reviews on your website, blog, brochures or any other online marketing channels you use to reach Gen Y women. More on the marketing channels further in this post. Other data every marketer should know is that Gen Y women are more interested in purchasing from a brand they like or they trust based on peer reviews than purchasing based on price. This is a feature that is available for most of the product categories except fashion industry. Depending on product category, it seems that brand loyalty significantly influences purchase when it comes to Gen Y women. As a matter of fact, I believe that this is the case for any Gen Y customer – to base the purchase on loyalty towards the brand and not based on price. Any business that’s based on pricing cheap will disappear from the market sooner or later. 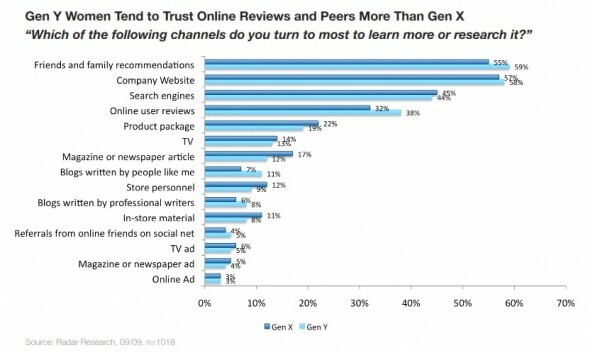 One of the most interesting data revealed by the Radar Research on Gen Y women in my opinion is the graph revealing the channels via which Gen Y women are most likely to discover new brands. As opposed to Gen X women, the largest difference between the two generations is “a profile or status update”, a channel that helps 42% Gen Y women discover new brands. 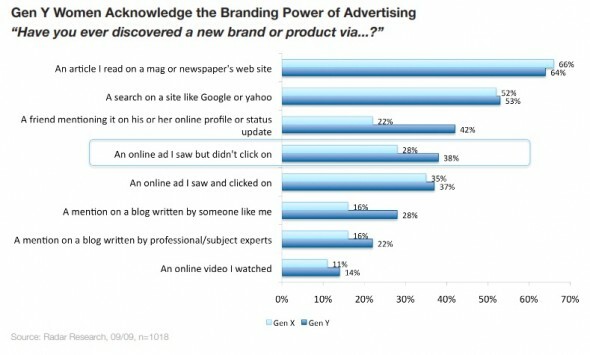 Still, the greatest way for both women generations to discover new brands is an article read on a magazine or newspaper’s website, 64% versus 66% for Gen X women. Also, Gen Y women are inundated with ads and learnt how to avoid them. Therefore, a staggering proportion of 38% of Gen Y women are aware of your ads even though they don’t click on it. For them to click on your ads depends largely on the context of that ad. You should target Gen Y women with ads placed on websites and blogs they already trust. Now that I revealed some of the most interesting data about Gen Y women, I am interested to find out what channels you use to target Gen Y women especially. Please tell me, what do you think? 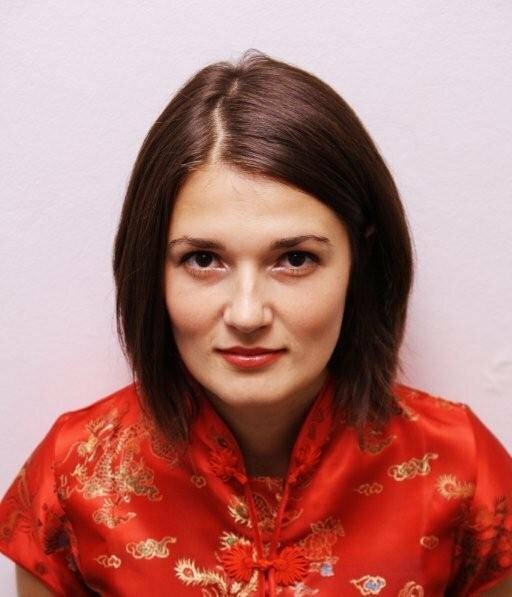 Why don’t Gen Y women buy from you? — REsearch. REact. REfresh.